Spring is here guys and that means longer and hopefully warmer days, we seem to have had a couple of good Spring days for it to continue to rain and blowing a gale again; typical British weather I suppose. Anyway I'm feeling good that we at least have more longer days which is a bloggers dream, more light, more time, more photos and better lighting. At the weekend me and the boy went down to visit our parents for Mother's Day and did a photoshoot whilst we was there. 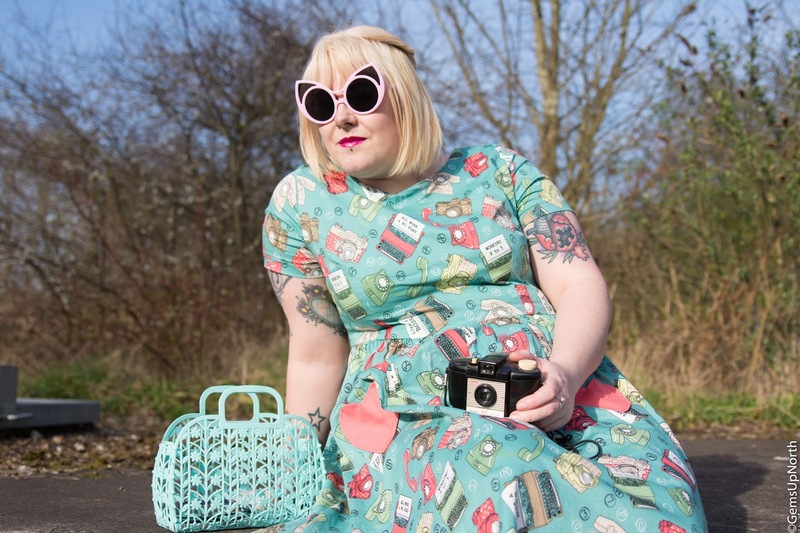 I'd already taken a few photographs featuring the *'Brittany Teal Study Print dress' that I was kindly sent but I wanted to get some more images in the Spring daylight and in a new location. 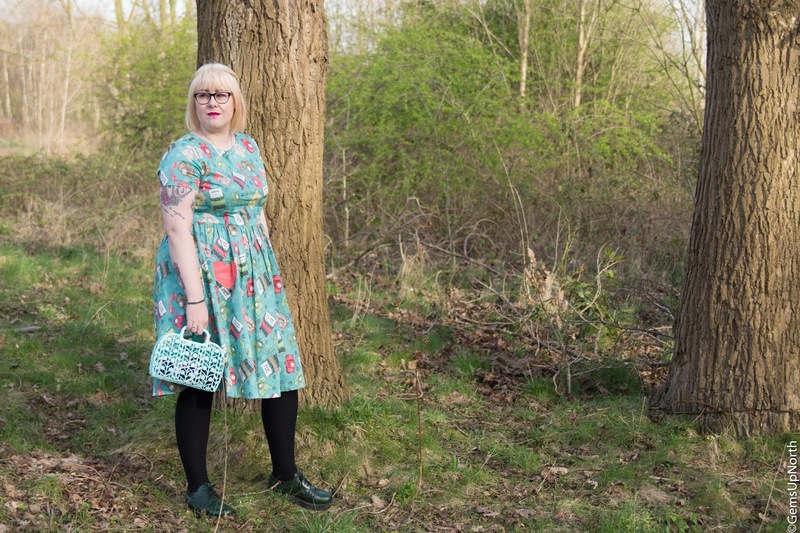 We decided to shoot in a wooded area with all the greenery to match the dress and make the details pop. 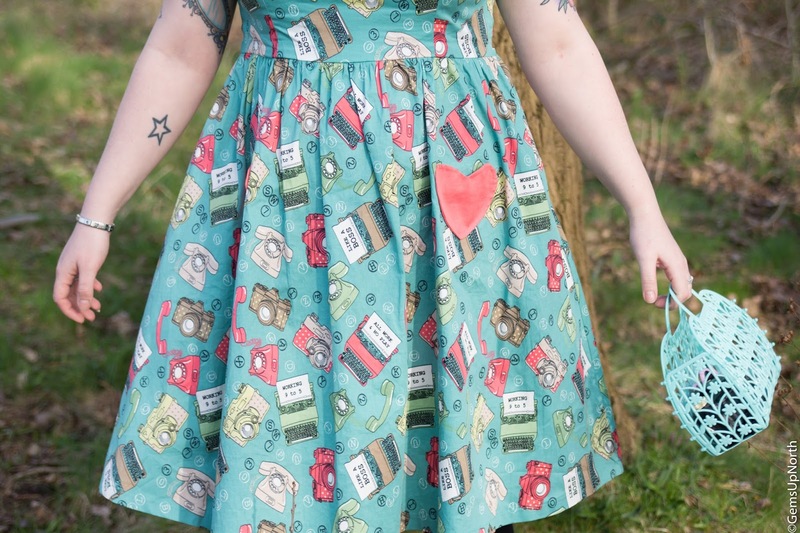 If you caught my last Lindy Bop post featuring the Audrina Roller Skate dress you'll know that Lindy Bop contacted me after London Edge and sent me a few dresses to review and here is the second post. Since the Spring air is still a bit crisp I wanted to wear tights with the dress to keep me warm although on Sunday I think I could of gone bare legged with socks, maybe. I kept the green theme and paired the Study Print dress with one of my favourite pairs of shoes from Underground shoes; these Macbeth creepers are so comfortable and I never had to break them in, they are a perfect fit and have kept looking newish because of the patent material. I can literally wear these creepers with anything even though they are green they work with jeans, skirts, dresses and much more. I'd love a pair in black so I could wear them for work too. The Study Print on the dress is totally up my street with the camera print alone, I'm a photography junkie especially after studying the subject at college and continuing my love for it through university and even now, I just wish I had more time to go on photography days. 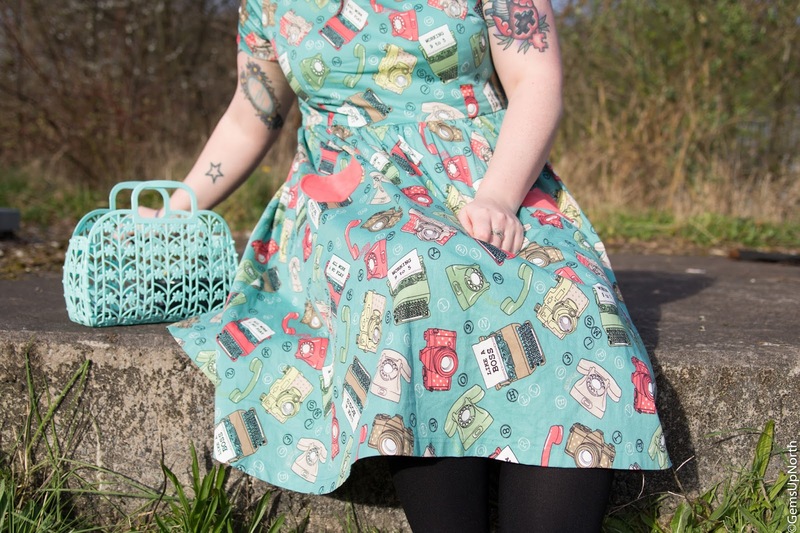 The dress has typewriters with slogan text 'Like A Boss' and 'Working 9-5, contrasting coloured telephones and numbers/letters floating in the negative space around the illustrations. All these images fit together perfectly and fill the dress nicely. 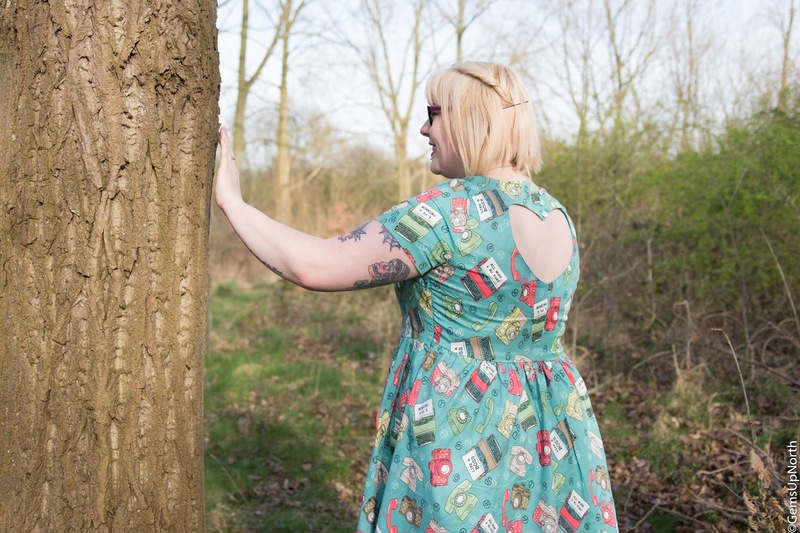 There's another amazing detail on this dress that made me love it even more, check out the back of the dress ...... the heart shaped back really makes me want this style of dress in every print that Lindy Bop create. The 3 little buttons fasten at the top with elastic loops and there is a concealed zip under the arm to help get the dress on and your left with this beautiful fit and a dress that can be worn anyway of the week. Now lets talk about the pockets! 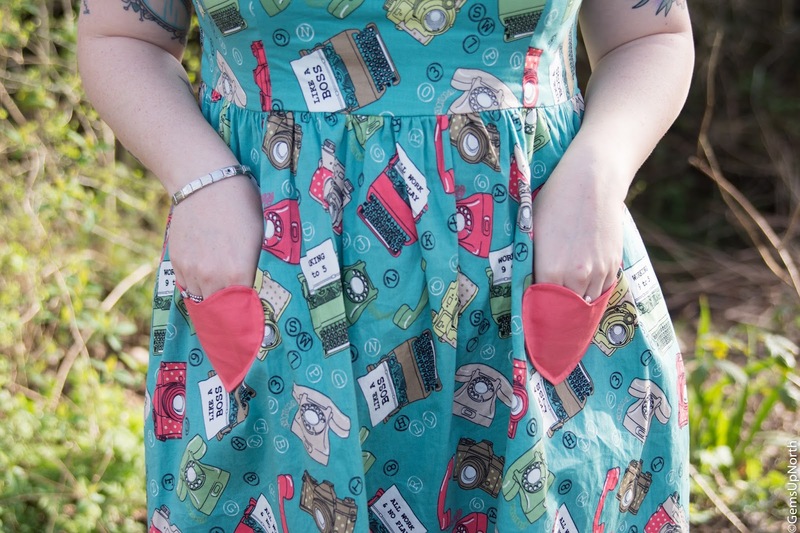 I love a dress with pockets and the heart shape theme continues from the back of the dress to the front with these cute contrasting colour heart shaped pockets; how cute? 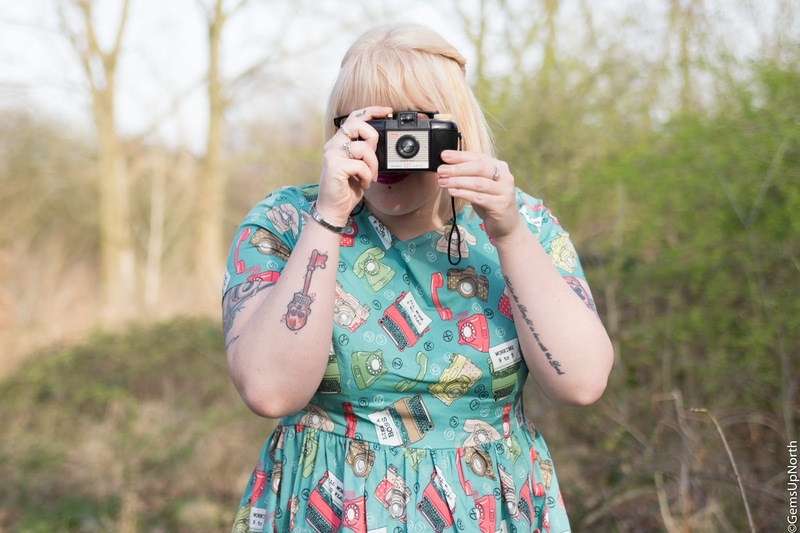 I must admit you can't really fit much in them apart from some loose change, an extra memory card for you camera or some butter mints (thinking vintage here) but they add a pop of colour and heart detail to the front of the dress. 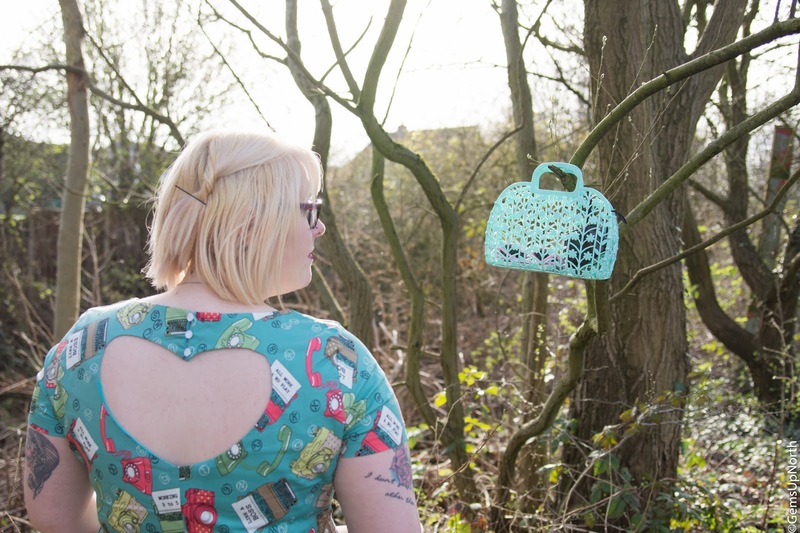 Last but not least the jelly tote bag that I've paired the dress with, went along with the vintage style of Lindy Bop and was in another contrasting but similar colour in mint green. I picked this little bag up from the Kid's section in H&M last year, they had a few colours in but I went with this mint one as it was a little different; I only paid £2.99 for this too, what an absolute bargain! Jumping back onto the 'Spring is here' conversation, what's everyone got planned? April has become a busy month for me starting with a gig this weekend, comic con the weekend after, I'm away with the boy over Easter and then the weekend after that its my friends engagement party. The party will give me chance to wear one of my Lindy Bop dresses though; not that I need an excuse. *PR Sample - all thoughts/opinions are my own, see my disclaimer for more info. I'm overwhelmed with your comments beaut, THANK YOU SO MUCH for all your support and kindness. Yes for more light and blog shoots, the lighter and warmer days better stay around. Thanks again for reading my post fully and glad you enjoyed the post. I'm so happy about the lighter nights and that spring is here! Yes yes yes for the weather, we've had a good few days of it, I hope it sticks around.